Born and raised in Tacoma, WA, baritone Ryan Christopher Bede made his Seattle Opera solo debut in May 2017 as the Second Priest in The Magic Flute, followed by Prince Yamadori in Madama Butterfly, Jim Crowley in An American Dream and Fiorello in The Barber Of Seville in the 2017-18 season. He returns as Moralés in Carmen in May 2019. He also returns to Opera Idaho this season as Masetto in Don Giovanni after performing Papageno in The Magic Flute to great acclaim. In the Spring of 2019 he makes his role debut as Belcore in The Elixir Of Love with Tacoma Opera, where he has appeared in numerous roles such as Moralés/Le Dancaïre in Carmen, Tiger Brown in The Threeepenny Opera, Papageno, Mercutio in Roméo et Juliette, Schaunard in La Boheme and the Pirate King in The Pirates Of Penzance. Recent concert engagements have included Handel's Messiah with both the Bremerton Symphony and Federal Way Symphony, Spectrum Dance Theater's acclaimed production of Carmina Burana as well as Bach's Christmas Oratorio with Early Music Vancouver/Pacific Musicworks, conducted by Stephen Stubbs. He has been a frequent soloist with Orchestra Seattle in such masterpieces as Fauré's Requiem, Duruflé's Requiem, Haydn's Die Jahreszeiten, and Vaughan Williams's Fantasia On Christmas Carols. He sang Rutter's Mass Of The Children with the Everett Chorale and Bellevue Presbyterian Church, and in the summer of 2017 he performed the bass solo in Mozart's Requiem in Sofia and Varna, Bulgaria under the baton of Dr. Steven Zopfi and Dr. Scott Glysson. Other recent performances have included a solo appearance with the Cal Poly Symphony & Chorus (Duruflé Requiem and Ravel Don Quichotte a Dulcinée), the role of the Land Speculator in the premiere of Sarah Mattox's opera Heart Mountain with Vespertine Opera, Samuel Barber's Dover Beach with the Seattle-based Bella Sala Ensemble, Dr. Falke in Die Fledermaus and Morales/Dancaire with Pacific Northwest (formerly Skagit) Opera, and Albert in Werther with Vashon Opera. He spent a summer as an Emerging Artist with Opera New Jersey and has also performed as a soloist with numerous orchestras in the Pacific Northwest. He is a former Young Artist with Tacoma Opera and the Aspen Opera Theater Center, and was a two-time recipient of the Seattle Opera Guild Singers Training Fund Grant. He completed his studies at the University of Puget Sound and the University of Washington, and now frequently performs as a lecturer and preview artist for the Seattle Opera Guild. 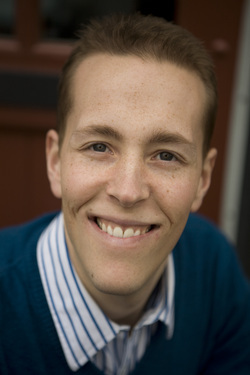 He presently serves as the baritone soloist and section leader at Bellevue Presbyterian Church, and teaches voice at the University Of Puget Sound and Tacoma Community College, as well as maintaining a private studio in the Tacoma area.